Stressful days fade away when you’re kicked back in the big, beautiful Peyton™ spa by Sundance. 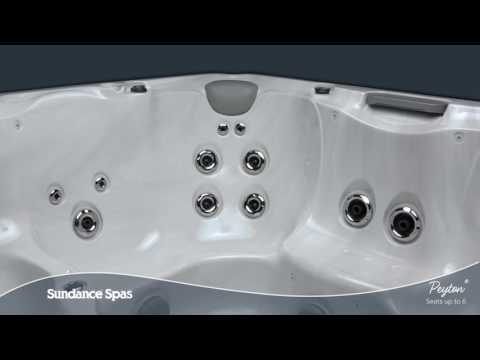 Like the Hawthorne™ and Hartford™ 680™ Series Spas, the Peyton comes standard with a Custom Luxury (CL) package. This spa has the beauty and the functionality, you’ll want to have. CL Designer Jets in stainless steel put the polish on your spa and accentuate the multicolor glow from the LED Lighting. The lighting highlights the waterfall, and enhances your overall experience. All of the Custom Luxury features are standard and factory-installed, so you can enjoy them from the moment you get into your new spa. The BLUEWAVE™ spa stereo system is available as well. The Peyton – a big hot tub that’s also big on value! Somebody’s got to enjoy it. Why not you?